This class is not currently in use. All of the above will yield a FriendDecl, not a FriendTemplateDecl. Definition at line 2252 of file DeclTemplate.h. Definition at line 2256 of file DeclTemplate.h. Definition at line 2318 of file DeclTemplate.h. Definition at line 2319 of file DeclTemplate.h. Definition at line 889 of file DeclTemplate.cpp. Definition at line 896 of file DeclTemplate.cpp. If this friend declaration names a templated function (or a member function of a templated type), return that type; otherwise return null. Definition at line 2299 of file DeclTemplate.h. Retrieves the location of the 'friend' keyword. Definition at line 2304 of file DeclTemplate.h. 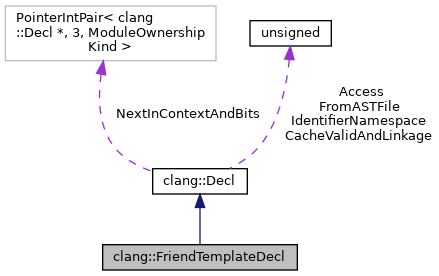 If this friend declaration names a templated type (or a dependent member type of a templated type), return that type; otherwise return null. Definition at line 2292 of file DeclTemplate.h. Definition at line 2313 of file DeclTemplate.h. Definition at line 2308 of file DeclTemplate.h. Definition at line 2280 of file DeclTemplate.h.